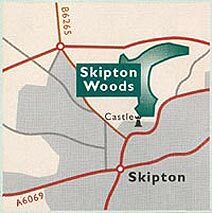 For nearly a thousand years Skipton Castle Woods provided fuel, building materials and food to the castle it surrounds. And the waterways that run through it gave power to local wool, corn and saw mills across two centuries. The forest was carefully managed for firewood, timber and for hunting, while the beck provided fresh water and plenty of fish. But through all this management and heavy usage the spirit of the woods has never changed. It's still one of the most beautiful, serene sites Spend a couple of hours following the valley of the Eller Beck, sit and admire some stunning views, soak up the peace and the history. You'll go home recharged! The Wood is dominated by Ash, grown to full height for good quality timber. at least seventeen other tree species flourish here too, including Oak, Hornbeam, Lime, Chestnut, Rowan and Sloe. Some aren't native to our woods, but were planted either for decoration or for cash. Conifers like the Scots pine and Norway spruce in the northern section, for instance, were planted in the 50's and 60's to feed what seemed an insatiable demand for softwoods. But there was a price to pay. As you can see, conifers keep out the light. And their needles make a toxic bed that drastically reduces ground cover for wildlife and insects. The Woodland Trust and other caring landowners are very gradually thinning conifers from many of our ancient woods, allowing native broadleaf trees to regenerate and flourish in their place. At Skipton Castle Woods, we are watching the sycamores closely, too. It's not a native tree, but it spreads very quickly, creating shade and hindering native tree regeneration. Generally though, even non-native and coniferous trees will be left, since they are home to their own special communities of plants, animals and lichens, and reflect the diverse history of the site. It is a wonderful place for wildlife - and especially for bats with strong teeth! They're not harmful to humans of course - but moths and beetles have to look over their shoulders at night. They're hunted by the noctule, one of the biggest British bats. Usually the first to appear in the evenings, it uses a sophisticated echo system to hunt insects - which it then crunches in its powerful jaws. The combination of standing dead trees and rock fissures for roosting and insect-breeding water for food make Skipton a real haven for bats. Four other species have been spotted here - Daubenton's the brown long-eared, the natterer and Britain's tiniest bat, the pipistrelle. You may see roe deer at Skipton too. Shy beautiful creatures, they can be unpopular with foresters since they can eat a wood to destruction if left unchecked. Well over 160 flowering plants, trees, grasses, sedges and ferns flourish in Skipton Castle Woods, including some rare orchids. The less rare but still beautiful early purple and common spotted orchids grow here too. You'll also see bluebells, wild garlic, enchanter's nightshade and hedge woundwort here - but try not to crush the latter, it makes a terrible smell if you do! Figwort, burdock, herb paris, ragged robin and dog's mercury all grow here too. How many can you spot? Woodland flowers can be useful as well as beautiful. Some give us important clues to the age of an ancient wood - being poor colonisers they don't appear in recent woodland. Others are only found in very specific regions or woodland types, needing exactly the right amounts of shade, light and damp to exist. And of course, butterflies love them! 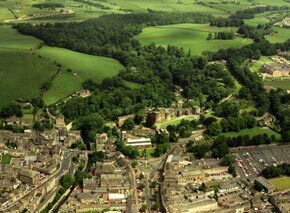 The wood circles the northern boundary of Skipton Castle on the Northern outskirts of Skipton, North Yorkshire. 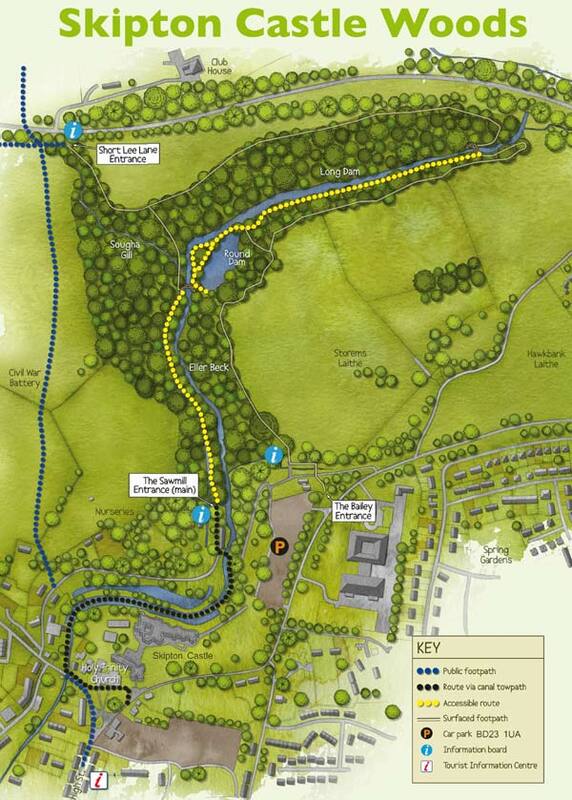 From the town's High Street you can walk into the wood along the towpath of the Springs Canal, passing the Castle on the way. The wood is clearly signposted. There are over 2000 metres of surfaced trails within the wood, although the path along the top of the wood is very steep and unsuitable for the less able.